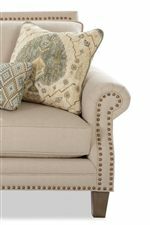 The supremely sophisticated sofas and chairs from this group feature stunning nailhead trim borders, available in your choice of brass or pewter-colored studs. Your friends are sure to be jealous of this perfectly ornamented style, creating classic elegance with rolled arms and contrasting accent pillows. Soft, down-wrapped seat cushions add sink-in comfort to this exceptional group. Browse other items in the 747 collection from AHFA in the area.